My name is Miquelle Taubman and I’m from the San Francisco Bay Area. This semester is my first semester with Aardvark, and I couldn’t be happier! Before joining Aardvark in January, I worked for my uncle’s personal injury law firm in California. 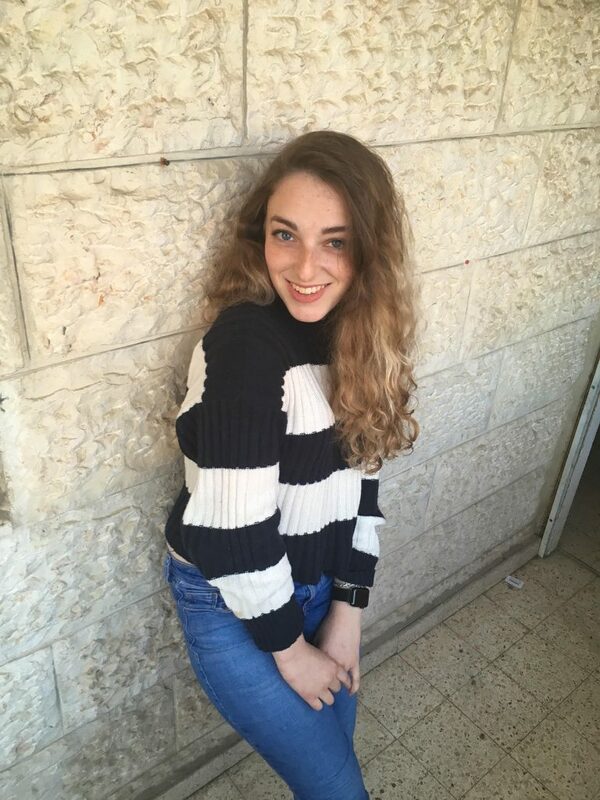 I chose to do a gap year program in Israel because I love to travel and I wanted an extra year before attending college to learn more about myself and gain more experiences. And what better a place to do those things than Jerusalem! Through Aardvark, I am interning for the Jerusalem Youth Chorus, where I get to help teach music theory and lead rehearsals, and do some of the behind the scenes work for the chorus’ office. I have been singing in a classical chorus and received classical training for the last eleven years so I am really happy to be able to continue that education and musical experience. While I have toured internationally and was lucky enough to sing with some fantastic venues and musical organizations, I have spent my entire musical career singing with groups in San Francisco. This internship represents a wonderful opportunity to expand my horizons, learn from new instructors, dive into teaching, and meet kids from disparate cultures. At the Jerusalem Youth Chorus (JYC), the students are high school aged and speak English, Hebrew, or Arabic, as it is an interfaith and intercultural chorus. The idea is that music has the power to unite everyone despite differences in cultures and despite political conflict. This statement is very important to me and already I have seen this come true. During rehearsals, the students enjoy group activities and sing together in both rehearsal and breaks. At every rehearsal on Monday evenings, the chorus holds an hour-long “Dialogue” session where the students discuss everything from “what defines music?” to “what does it mean to live in the middle of a very divided political and cultural conflict?”. I am very grateful to be able to help unite people through something I love like music. Aardvark has also given me a platform to learn and explore the state and land of Israel. From trips to the boarder of Gaza to discussions on the IDF, Ulpan classes and tons of fun, I couldn’t have chosen a better experience. Most people would describe a gap year as a year off. On the contrary, this has been a year ‘on.’ Aardvark has not only privileged me to live in Israel, but has pushed me to become my best self!